Why Invest in Organic Search engine Optimization with and SEO Company Like Optimize San Antonio? The first place someone is going to look if they want to hire a company for service is the internet. Your rankings on the major search engines directly effects your ability to generate new sales lead, customers and contacts. Each day billions of people perform keyword searches for specific topics, servies, and information. 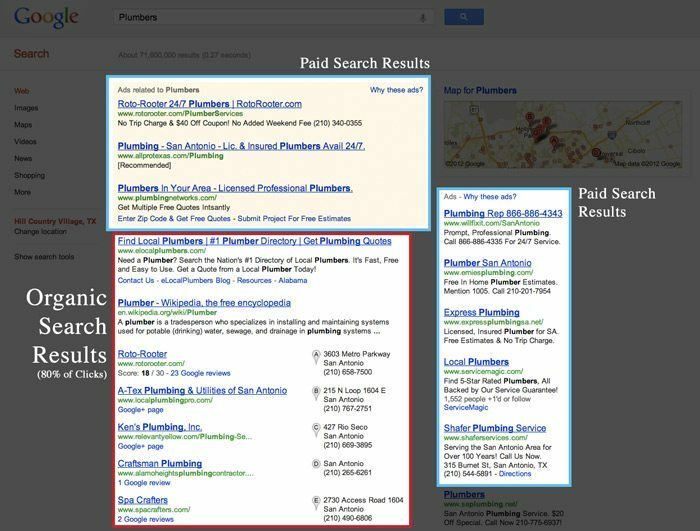 On the major search engines like Google, Bing and Yahoo about 80% off all clicks are generated from the “organic search results” and rougly the remaining 20% of all clicks go to paid advertising. Optimize San Antonio can help get you started on the long climb to the top giving you progress and updates every step of the way. Our Search Engine Optimization Service offers you full tracking and reporting on keyword, overall site performance and competitive analysis on up to three of your major competitors.